Airbnb has exceeded just about everyone’s expectations. In eight short years, they’ve progressed from renting out a single air mattress in a San Francisco apartment to accommodating over 80 million travelers across 34,000 cities. Hotel executives that once scoffed at the idea of Airbnb disrupting their industry are now in an uphill battle to compete for the adventurous leisure traveler. Survey after survey has shown that Airbnb guests are more satisfied with Airbnb than traditional hotel stays. They prefer the uniqueness of the travel experience, the diversity of locations in which they can stay, and the value of accommodations. These high consumer satisfaction rates have fueled triple-digit growth for Airbnb each and every year. In our latest analysis, published in conjunction with Bank of America Merrill Lynch, Airbnb now accounts for 7.7% of total hotel room nights available for rent across the US. Airbnb popularity soars in many major markets and makes up 22.7% of the lodging supply in Miami Florida. Hundreds of cities around the world are now taxing Airbnb rentals at the same rate as hotels. Airbnb collects the taxes when a booking is made and then remits the lump sum at the end of the year. These vacation rental taxes have created significant revenue streams for progressive cities around the world. Unfortunately, many local legislators have been convinced by hotel associations that middle-class entrepreneurs are harmful to local economies and fail to accept the inevitable future of peer to peer booking platforms. In our analysis earlier this year, we estimate that New York City would have generated $28.5MM in additional occupancy tax in 2015, and Los Angeles would have added another $25.9MM in transient occupancy tax revenue if Airbnb rentals were taxed at the same rate as hotels. It seems like every day there is an announcement of a new city that is acting in the best interest of its residents and implementing taxes on short-term rentals. Short-term rentals have been largely overlooked by DMOs and other tourism organizations. Until recently, they have accounted for a tiny portion of the overall lodging market and it was impossible to get good data even if one had the inclination. The vacation rental market was comprised of thousands of small property management companies that would oversee a couple dozen units each and there was no good way to roll up the performance of all of these individual operators. Airbnb changed the game by getting into the middle of each transaction. By becoming the financial intermediary of every reservation, Airbnb became the largest aggregator of short-term rental data nearly overnight. Fast forward eight years and the treasure trove short-term travel insights has never been greater. 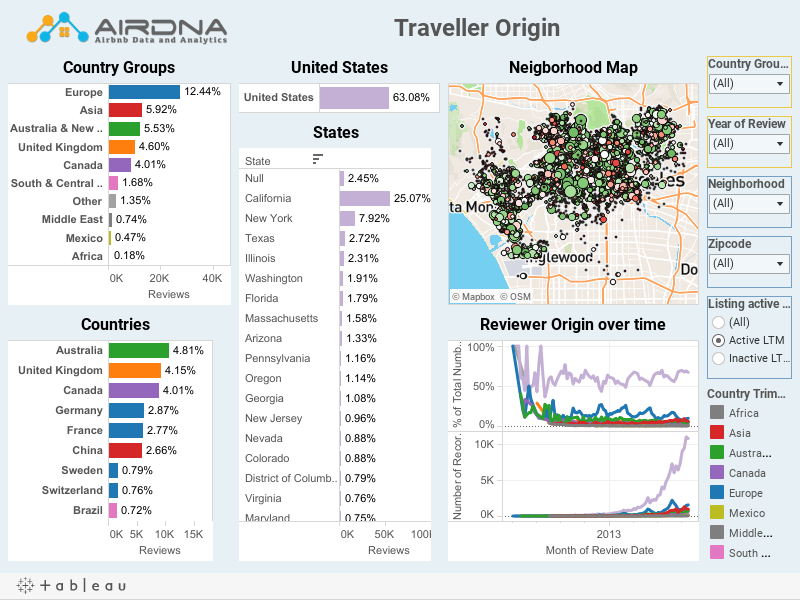 AirDNA has analyzed 32 million Airbnb reviews, 30 million reservations and 5 million Airbnb guests profiles to shed some light on the origin and demographics of Airbnb travelers and the revenue associated with their stays in over 5,000 cities worldwide. As a long time Airbnb host in the city of Los Angeles, I will take a deep dive into my hometown to analyze travel trends such as the origin of guests, the distribution of visitors across the city, and the revenues generated by Airbnb travel. 63% of visitors to the city of Los Angeles came from within the United States, with 25% of total visitors originating from within the state of California while New York added 8% of total guests. 37% of guests were from outside the USA, with Australia, the UK, and Canada all comprising between 4% and 5% of visitors each. The travel demand for specific neighborhoods within LA is interesting. For example, the Playa Vista neighborhood is close to the beach and Los Angeles International Airport, but no hotels reside in the neighborhood. Nearly 50% of visitors to the area are traveling from outside of the USA., with 17% from Europe and 11% from Asia. Comparing this to Downtown LA which has only 27% of visitors traveling from outside of the United States, with 7% from Europe and 6% from Asia. This data can be analyzed at an even deeper level to understand the exact cities guests are traveling from as well as some basic demographic information. This Airbnb data for DMOs is powerful in the right hands. International travelers stay longer and spend more on average. More targeted ad campaigns to these hyper-focused customer segments can create a massive ROI. 26.5% of all guest reviews in LA came from repeat visitors. Of guests that returned to LA exactly twice, only 10% of them stayed at the same property for both visits. Of guests that visited exactly four times, 68.5% stayed at four separate rentals. Airbnb hosts are doing a terrible job of nurturing their most lucrative source of business – previous guests. OTAs, including Airbnb, have started to dominate the source of vacation rental bookings. The fees for sourcing bookings continue to increase and individual hosts will need to do a better job retargeting previous guests. This creates an opportunity for forward-thinking DMOs. Marketing unique and aspirational short-term rentals in the area is a great way to make your destination stand out in the crowd. A great example is this treehouse in Atlanta, Georgia, which Airbnb recognized as “The Most Wished-For Listing Worldwide”. The headline number that everyone wants to get their hand is overall host revenue. How much revenue is actually being put into the hands local Airbnb hosts and what corresponding revenues are these guests generating for local businesses. The first question is easier to answer so let’s start there. I’ll refer to our Custom Reports for DMOs for a quick look at how the overall Airbnb market is trending in the greater Los Angeles Metropolitan Area. Los Angeles is the 5th largest Airbnb market in the world with 28,200 total listing available for rent in July 2016. These listings account for 16.8% of the total lodging room supply in the city. In the month of July 2016, $51.8MM of revenue was generated by entire place rentals on Airbnb. This is up 68% from the $30.9MM generated in the same month in the previous year. This is a highly disputed topic. Depending on what assumption are made, and what group has commissioned the study, the results vary widely. I will not attempt to recreate these economic impact studies but simply reveal a few important figures to keep in mind when reviewing numbers submitted by Airbnb or the Hotel Associations and their affiliated organizations such as “Share Better”. The majority of local hotel profits are shipped out of state to corporate headquarters never to be re-circulated in local economies. The average Airbnb stay in the US is 4.5 days and the average hotel stay is 1.5 days. Airbnb guests spread economic stimulus throughout a city a more evenly. This is only logical based on the highly distributed supply of Airbnb rentals as compared to hotel properties. What Does This Mean for DMOs? 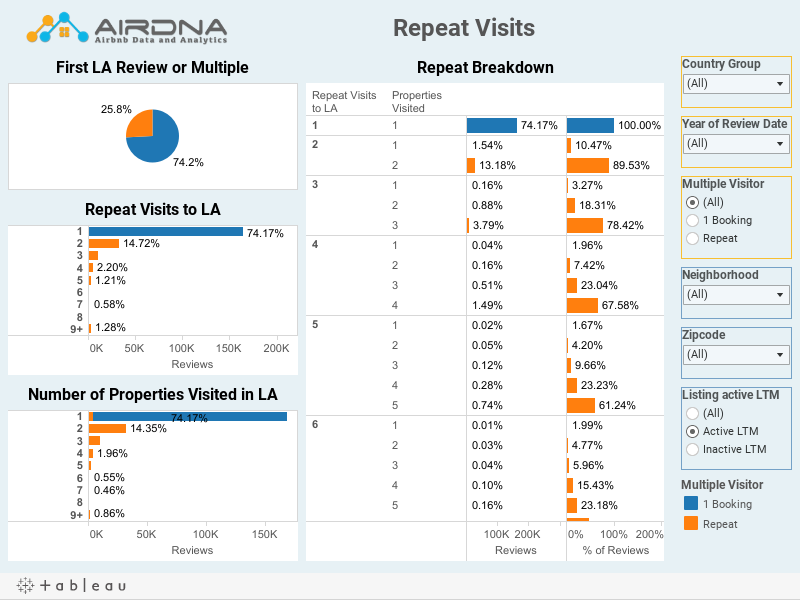 AirDNA’s tool is an amazing resource for DMOs to understand their visitors better. Now they can see, in almost real time, where their visitors came from and how often they return. Even better, they can quickly see how effective their marketing strategies are. If a DMO puts on a big marketing campaign in New York for visitors to come to Los Angeles, the size of the Airbnb market provides a great proxy for how effective their campaigns are. The lines continue to blur between home rentals and hotel stays and the revenue generated by these ‘alternative’ accommodations can no longer be ignored. A more holistic marketing strategy is needed to attract visitors and measure the success of advertising campaigns. Also, Airbnb offers a treasure trove of visitor information so DMOs can get ahead in monitoring and targeting their campaigns. To learn more about how to be at the cutting edge of the collaborative economy era, drop us an email.